In an effort to inspire an interest in young women to consider a career in the construction industry, the Construction & Maintenance Education Foundation (CMEF) , the educational affiliate of Associated Builders and Contractors of Greater Houston , partnered with local construction industry professionals to facilitate the 2019 Girls Construction Camp at CMEF’s Performance Verification Center on February 27. Since 2016, CMEF’s Girls Construction Camp provides female students with career awareness and experience in the construction industry. After spending a full day on education and activities, the students then have additional information to work with their parents and counselor to select a high school graduation endorsement plan and career pathway. Most of the volunteers who lead the various sessions are women in the construction industry. CMEF desires for students to strive to become the highly skilled, construction industry professional of the future, and having women to admire is very important to the success of the young students. 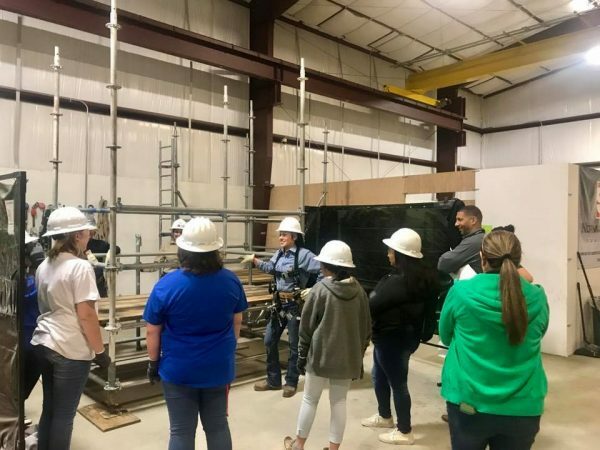 Thirty-two eighth grade female students spent the day participating in numerous hands-on skills that are performed daily by craft professionals including carpentry, dry wall installation and finishing, equipment operations, scaffold building, and pipefitting. The students represented four ISDs and nine intermediate high schools and were selected from within the school districts that CMEF sponsors. By the close of the event, the students left with a new awareness and appreciation for the construction industry and the vast diversity of great career opportunities that await them in the future. CMEF hopes that the information the students gleaned from participating in the hands-on events coupled with the printed material they received, will assist them in making a decision on selecting a Graduation Endorsement Plan and Career Pathway that they may not have otherwise considered. Associated Builders and Contractors (ABC)  is a national construction industry trade association representing more than 21,000 members nationwide. Locally, ABC Greater Houston was founded in 1969, and today serves several hundred commercial and industrial contractors, suppliers and construction associates in the Greater Houston area. Associated Builders and Contractors of Greater Houston represents the interests of merit shop contractors and its employees in the policy making process of the government, protects and enhances the free enterprise system within the construction industry, and provides educational, marketing, and informational programs for the benefit of members and their employees. Construction & Maintenance Education Foundation (CMEF) is the vehicle through which industry and craft professionals in the Houston area receive formal training. Our goal is to recruit new entrants and retain existing workers through a variety of programs focused on assessment, training, and continuing education. We believe that a community approach to training is fundamental to developing a skilled and educated craft workforce within the entire industry.